We currently have 5 products in our review section. Had a good experience with one of our products ?, contact us and let us know. The Glock 34 is a 9mm pistol designed for use in standard class IPSC shooting. Hand size groups at 25 meters no problem. More accuracy can be had with better sights. Dawson do a nice fiber optic target sight for the Glock. Not as pretty as a 1911 but gets the job done. Typical Glock quality and reliability. Adjustable sights are not the greatest. Extended mag release, lighter 3.5# trigger, good ergonomics make the G34 easy to use and shoot. Being in Standard class there is a good range of modifications available to enhance further. Compared to a comparative 1911 the Glock 34 represents very good value for money. Highly competitive and up there with 1911s, can still benefit from modifications to make it competitive in its class against the more higher priced 1911s such as the STI. The Marlin 917VT is a bolt action 17HMR rifle designed for small game hunting and pest control. It comes with a 4 shot and 7 shot magazine, blued finish and beautiful American hardwood laminate stock. Barrel is heavy varmint \ target barrel. Using a 4-9X40 Tasco Scope body shots on rabbits upto 200 meters are possible, and almost certain with a slightly higher power scope. Using the test scope any rabbit within 100 meters on a steady shot is pretty much dead. I could not fault the build quality of the rifle, everything from the blued finish to the beautiful and very comfortable stock was just great. a) the magazines are a bit fidgety to get in at first. b) the bolt action is not smooth but will loosen up with time and use. c) trigger although smooth and crisp could be a tad lighter. If you don't want to shell out the extra $$$ for the Savage 97R17 BTV with its adjustable trigger and smoother bolt, then this rifle is excellent value and quality for the money. Ammo is more than the .22LR but you get double the effective kill range. A solid rifle for small game and pest control on the farm for the places where a .22LR falls short. You cant go wrong with this rifle or the slightly more expensive Savage 97R17 BTV but in my opinion the Marlin looks nicer. The Taurus PT99 is a 9mm semi automatic pistol made in Brazil. 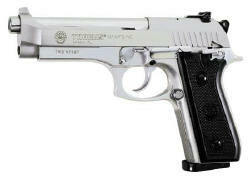 Modeled on the Beretta 92 but with improved features and lower price. Finished with a polished stainless slide and alloy frame it comes with 2 X 17 Rounds Magazines and has fixed front sight and adjustable rear. Out of the box at 25 meters it was shooting 50cm low and 20cm left, after some adjustments it was shooting about 3" groups at bench rest. at 5 meters close range the grouping was outstanding 1" hole on hole. The combat sights could use a bit of painting to make them easier to line up but its easy to tell this has the potential to be a very accurate production class pistol. This is a DA\SA pistol so the first double action trigger pull is heavy (about 8 pounds) every subsequent shot is single action (about 4 pounds) and relatively short pull required. The build quality of the PT99 is great, the guns are hand finished at the factory and you can certainly tell. the stainless slide and alloy frame are flawless in finish. The trigger is steel, guide rod is also steel, the whole gun just has a high quality feel about it. My only complaint would be the plastic grips, but even after a $60 rubber grip upgrade this gun is still great value. The magazines don't come with any plastic base plates and these would be recommended if you plan to drop mags on the ground, otherwise they are good quality and corrosion resistant coated. This has got to be one of the easiest guns to strip down. The entire gun can be disassembled in under 15 seconds without tools. My only complaint is some of the areas in the slide can be hard to reach with cleaning tools, but a good spray solvent can flush these areas out. All the controls (slide release, mag release and safeties) are within easy reach and are easy to operate with the thumb but smaller hands might struggle to reach to slide release. This is a full size service pistol so suits medium to large hands. .
Cheaper than a Beretta 92, and built better, the PT99 is great value for money when you compare other pistols in the same price group. If you're looking for an excellent first 9mm for production class or simply casual shooting then the PT99 is a good choice, with its high quality and good accuracy and in my opinion, bargin price, you couldn't ask for anymore except for rubber grips and magazine base plates to complete the package. Even without these simple items its still good out of the box and far superior to the Beretta 92. The Para Ordnance 18-9 LDA Limited is a Canadian made 9mm Semi Auto Pistol. It is finished with Stainless steel 2 tone slide, corrosion resistant coated alloy frame it comes with 3 x 18 round magazines and has fully adjustable target sights. After adjusting the sights which were way low out of the factory, with slow steady shots at 25 meters this pistol is capable of 4 inch grouping, possibly less in the hands of a more experienced shooter. The LDA (Light Double Action) trigger makes fast accurate shooting a little difficult and less accurate, but practice makes perfect they say and some people are winning Production class matches using this same pistol right out of the box). This is a well built 1911 pistol, the polished stainless coupled with the black tones and matt coated frame make for a nice looking pistol. All the tolerances on the pistol were tight. My only complaint and hence a 4/5 rating is at this price point a checkered front strap would have been nice. As with all 1911s all the controls are in the right place and easy to reach, for competition use an extended slide release is recommended but besides this everything else just works great. The LDA trigger is a bit of a dog at first, especially if you've been shooting single action, its long (yet very light pull) to the fire point (about 3 pounds) and a very very short pull (of 6 pounds) to fire. The reset is fairly long making fast follow up shots very hard. The technique is to take up that long light slack whilst the pistol is coming down from the last shot, so its ready to fire immediately after re-aiming. I guess the hard thing with this pistol is remembering its essentially an assisted double action so cannot be compared to a single action even with its light trigger pull. For now I give it 3/5 until I master the LDA trigger. For a production class 1911 with features such as ramped barrel, power extractor, 3 high capacity magazines (18+1), high quality finish, and all this straight out of the box, the purchase price of $2300 was worth it when you compare other new 1911s with similar features. A good production class 1911 pistol. The Smith & Wesson Model 41 is a .22LR caliber 10 shot semi automatic target pistol. It has a bright blue finish, checked ergo wood grips and comes with fully adjustable sights. Bench rest at 25 meters the Model 41 was able to shot 9s and 10s on standard pistol NZ targets. I'm a new shooter and on a good day I can hit 7, 8 and 9 with the odd bullseye. The Model 41 is a solid heavy well built pistol with a brilliant blued finish and nice comfortable wooden grips. With tool free strip down the Model 41 is easy to disassemble clean and put back together, the whole gun breaks down into 5 parts, grip, barrel, slide, guide rod, spring. All the controls (mag release, slide release) are in a good position, the safety is a bit tight and hard to reach and stiff to engage but for a target pistol it is not required. The single action trigger pull is short and very light (about 3.5 pounds) so well suited to target shooting. I picked up mine second hand at Carvells Auctions for $650 a bargin considering these sell for over $1500 new. The new price is a little high for me as a new shooter but for someone who didn't mind the extra money this pistol would provide many years of reliable service. The overall design of the gun hasn't changed much since the 1960's a testament to its great design and reliability. For my first pistol I don't think I would have got a better .22 , it feels like a 3/4 size 1911, and looks the part as well, other .22 pistols i've looked at feel too small and have quirky controls. This is a great .22 pistol.